Now I know some of you are seeing the title of this post and thinking, “Isn’t it just something you put pills into?” And right you are, moreso than you know. Because while I am referring to a modern architectural feature all over the land of Israel, the pillboxes I am talking about also relate to what you’d see at a pharmacy. The pillboxes I’m talking about though are British pillboxes — military bunkers which you are sure to encounter on virtually any tour of Israel. And while I am describing pillboxes, I’ll also tell you about another related structure from the same era that similarly dots this country: the Tegart fortress. First a little background. The British controlled Palestine from the end of World War I until the 1948 declaration of an independent State of Israel. The era is known as the British Mandate, since Britain never intended to maintain control of the land or to annex it to the British Empire. It was always operating under a temporary mandate to oversee the land for the Jewish and Arab residents until control could be handed over to them. During that time, there were successive waves of Arab riots, both against Jews and against the British. First in 1920, then in 1929, and finally in a series of riots from 1936-1939, the Arab population displaced Jews from their homes and neighborhoods and tried to overthrow the British overseers. It is easy to see pillbox bunkers all over Israel today, though most are simply closed up. Very few, if any, are in secondary usage, or house museums or tourist attractions. They simply stand guarding major intersections or roads, a living memorial to the recent past. I don’t know how many were originally built, nor do I know if any or many of them have been subsequently destroyed. But I do know that if you keep your eyes open, you are sure to spot them. I know of three in Jerusalem alone (and I’m told there are at least one or two others in this city. 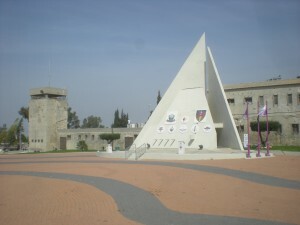 A Tegart Fortress that now houses the Givati Brigade Museum, known as the Yoav Fortress. Shortly after the construction of the pillboxes, a celebrated British engineer and police officer named Sir Charles Tegart was brought in to help further settle the unrest, after succeeding at handling rebellious Bengali in Calcutta, India. He arrived in Mandatory Palestine in 1938. His plan was to build larger fortresses throughout the country, all on the same basic architectural plan (though with a few variations of type). These were built of reinforced concrete, and were designed to house British police. They too usually guarded important road junctions and many still exist today. Some former Tegart forts currently serve as police stations (such as the one in Beit Shemesh) or prisons, while others are museums (such as the Givati Brigade Museum in the Yoav Fortress, or the Armored Corps Memorial and Museum at Latrun). Again, if you become familiar with what these fortresses look like, it is fairly easy to spot them all over Israel. They were actually quite effective, and when learning the history of the 1948 War of Independence, many important battles and operations took place at or in the shadow of Tegart forts and pillboxes. 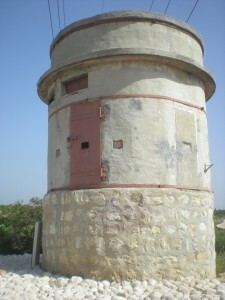 A slightly larger pillbox guarding an important set of bridges near Ashdod, at Ad Halom. In the months preceding the formal withdrawal of the British from Palestine, and the ensuing Israeli independence, the Brits began to consolidate their police. They gradually withdrew from Tegart fortresses in the outskirts of the country, all moving to the center, and then leaving from there at the same time. Unfortunately, however, it seems the British were just happy to be getting out and handing the problems over to someone else, because they had no plan for what to do with the Tegarts and Pillboxes as they left. Thus, each time they left one, Jews and Arabs raced to see who would be the ones to seize control first. For example, at Gesher, south of the Kineret / Sea of Galilee in the Jordan Valley, Jews seized control of the Tegart fort and were thus able to successfully hold off attack by much larger and more experienced forces. On the other hand, Egyptian forces took control of what is now known as the Yoav Fortress, east of Ashkelon. It took Israeli forces eight attempts before they were able to finally conquer it. Keep your eyes open on your next trip to Israel and you are sure to spot some pillboxes and Tegart fortresses. Just another example of how seemingly ordinary things can serve as constant reminders of this country’s complex and storied history. Great post. 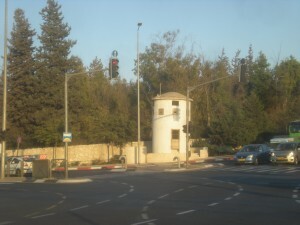 By the way, IDF routinely uses movable prefab “pillboxes” all around Judea and Samaria. 🙂 Thanks. Hadn’t thought of it in those terms! If you have any other suggestions for this kind of post, let me know. As an army man I’ve stayed in those for days at a time. And they are still called Pillboxes. Not so fun. But great to hear the history of them.